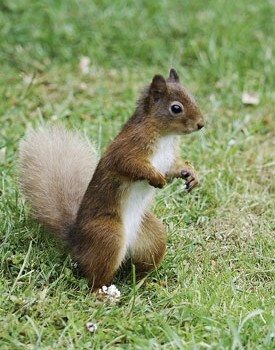 Places to visit to see red squirrels are listed below. They are divided by area under the headings of Cumbria, Northumberland, Yorkshire Dales and Devon. If you are ever in the Cockermouth area and like watching red squirrels whilst having a tasty lunchtime snack or afternoon tea, why not visit Squirrel’s Pantry? The people at Squirrel’s Pantry feed and look after the squirrels and are dedicated to maintaining their existence in the area. Please note that this is part of the Oakhurst Garden Centre. A very large forest and red squirrels elusive to spot, though they are there. An amazing forest nevertheless. Charged NT Parking at the entrance for non-members. A very large forest and red squirrels elusive to spot. Charged NT Parking at the entrance for non-members. Reds present in wood and you may have a chance sighting. Parking is at the entrance to the reserve. Reds often come to the feeder adjacent to the car park. A reserve worth visiting for the general wildlife too. 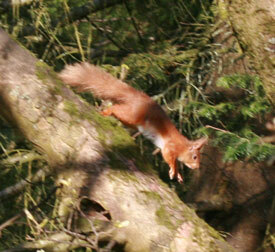 Approximately 11,000 trees and shrubs in 65 acres of woodland with red squirrels too. See link for parking/pricing details. Red Squirrel World Information Room in Castle and dedicated hide (NY63379363). Reds occasionally visit feeders adjacent to the Castle tea room. Forestry Commission parking fee applies. Worth a visit. Reds regularly come to the waterside hide for feed. Parking is designated nearby at the Waterside Park. A very large forest though red squirrels elusive to spot. 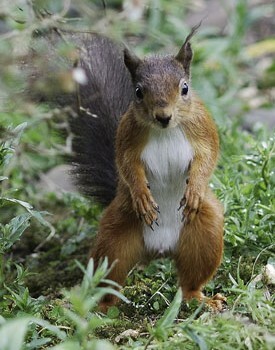 It is one of the longest monitored sites for red squirrels in the county, showing a constant presence. A very large forest and red squirrels elusive to spot. One of the most diverse conifer tree species collections in the county and impressive to visit. Reds often (normally early morning) come to the bird hide feeders in the gardens. A full-time ranger looks after the local red population. Charged NT Parking is at the entrance. Walk from the Forestry Commission car park around the pond. Reds can be seen in the surrounding woodland. Adjacent car park & coach house restaurant.